I haven't said anything yet! 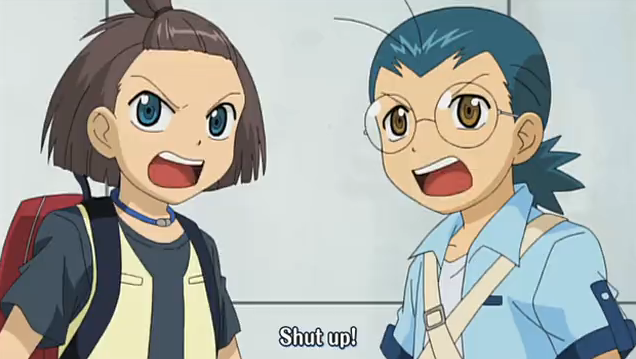 Despite Reiji and Eiji’s protests, I’m going to discuss episode 26 of Cardfight!! Vanguard. This episode takes us to the site of the national championship tounament, and through some of the opening ceremonies. Unfortunately for Team Q4, there is a bit of internal conflict, and they lose one of their better players. 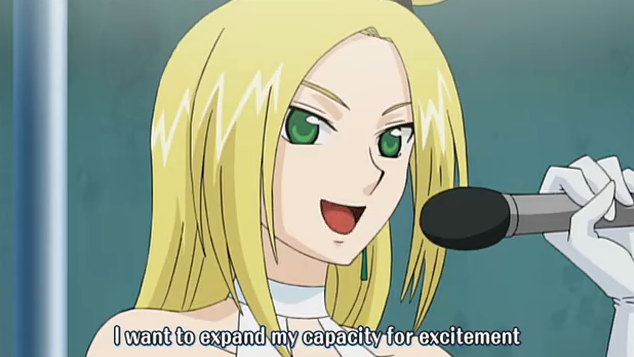 As Lucretia mentions on LuRa, this is an unusual episode, because there isn’t an actual Vanguard match. Since it is Summer, everybody except Kamui has a new outfit. 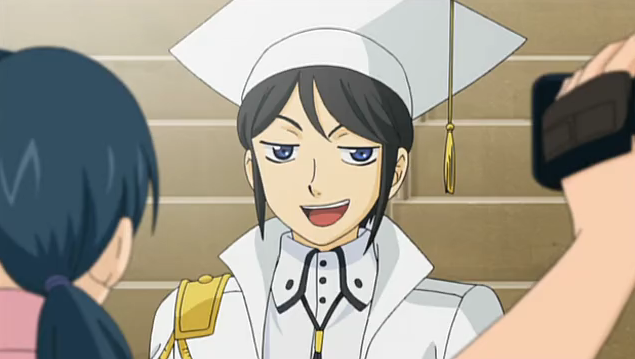 Kamui is the only grade-schooler on the team, so he is the only one to regularly be shown without a school uniform. Now that Summer is here, everyone gets to wear normal street clothes. 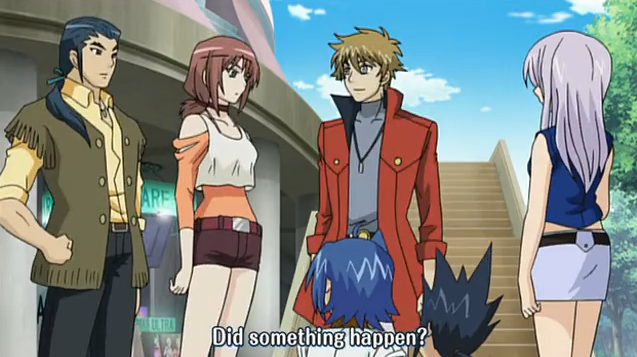 Aichi has particularly poor fashion sense (a white shirt with a GIGANTIC gold collar? ), and Misaki accessorizes with a key that I think unlocks the box she keeps her Vanguard cards in, because at the end of the last episode, she told Shin she didn’t have a key for the box. Anyways, Kamui and Kai aren’t getting along. This is clear from the start, and Kamui finally decides he has had enough of Kai’s attitude (which is annoying, let’s face it). He quits the team! Meanwhile, Opening ceremonies are going on, and we get introduced to some new characters. Doctor O. He's being interviewed by a TV crew, so he must be powerful, but I have a feeling he is going down in the near future. Team Caesar (l-r: Gai, Yuuri, Kenji). These guys took second place last year, and first place the year before. Even Ultra-Rare noticed this interaction. I'm sure Team Q4 won't have to face them until the second day. Team Caesar seem like really nice people. Not only does the leader, Kenji, read history books, his sister, Yuuri, was nice enough to offer Kamui a bandage when he fell down and went boom. Besides, I dig those groovy, early 70s threads, man! 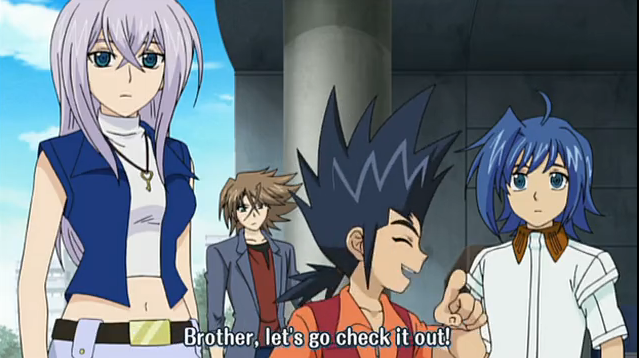 Kenji is thoughtful enough to stop Aichi from running after Kamui when he throws his tantrum, and urges Aichi to play in his stead, so that Kamui has a spot in the tournament’s second day. Anyways, if this show has a spin-off, I hope it is based on Team Ceasar, and their adventures as they travel around fighting crime. 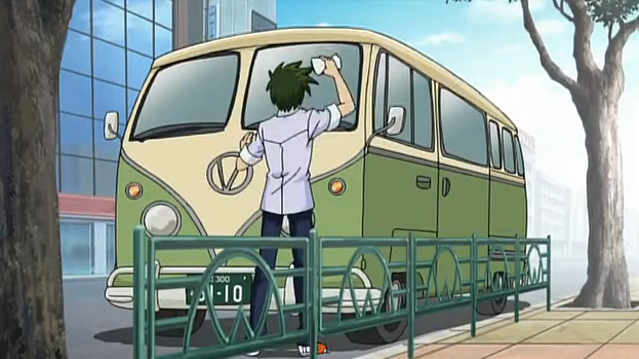 Speaking of early 70s references ... Shin cleans his VW van before driving Team Q4 to the tournament location. This episode also had an insert song performed by official Vanguard idol group, Ultra-Rare. 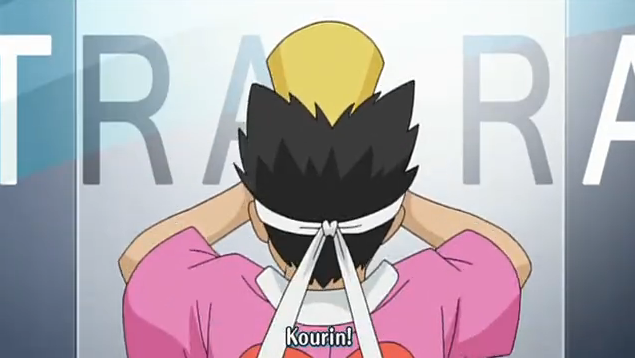 (Pictured: Ultra-Rare member Kourin). 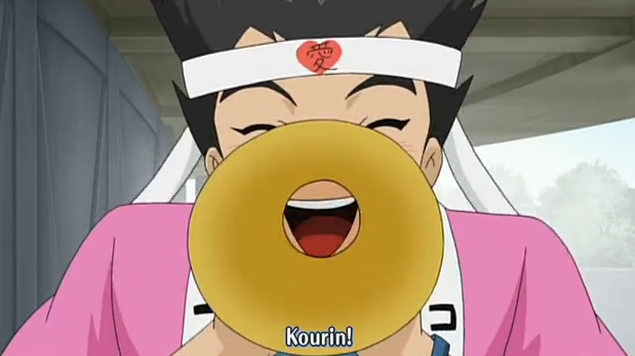 Katsumi is the very picture of the rabid idol fan. Folks, don't let this happen to you. Friends don't let friends turn into obnoxious idol otaku. This episode also introduced (at least I didn’t notice it last week) a new ED, “Dream Shooter”. Again check out LuRa’s blog where they have the video linked.